David Wally, 18, is one of 16 stewards working to clean up the land around Carcross. Photo by Madeline Lines. On a mountainside clearing near the babbling Chooutla Creek - a name meaning “laughing water” in the local Tagish dialect - David Wally is sprinkling tobacco into a small fire. The area was once home to the Chooutla Indian Residential School, and the tobacco is an offering of thanks. “It’s a way of saying we’re not here to harm anything, we’re just here to do research. We’re not here to put these spirits down, from the residential school, because there have been kids buried up on the hills over here,” says David. “It was just a terrible thing for those kids to go through. So we do that, and tell them we’re not here to bring that bad energy around. 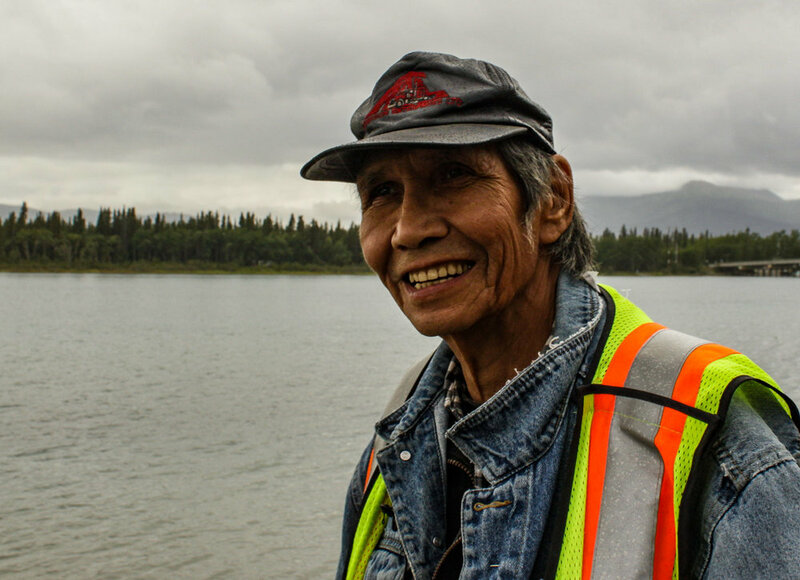 David is one of 16 stewards in Carcross/Tagish First Nation, Yukon. Today, his job is to help test the soil for toxic remnants of a colonial past, including the waste left from a residential school on sacred land, so that the community can imagine a healthier future. His colleague, Kashies James, is digging holes between half a metre and two metres deep with an excavator. They call it “stewardship” - a mix of odd jobs including construction, landscaping, land reclamation, and land restoration projects. The aim is to provide employment as well as opportunities for self-sufficiency and self-determination to individuals in the Carcross/Tagish First Nations community. This stewardship program is unique in Canada, and so is the idea behind it, says Nelson Lepine, CEO of Carcross Tagish Management Corporation. The philosophy is to put people before profit, according to Lepine. For example, instead of firing someone for being late, the team comes together to address the problem, support the individual, and welcome them back to work once they’ve addressed the root issue. Lepine says this isn’t about second chances, but instead, he sees it as offering “relief” when needed. Nelson Lepine is the CEO of the management corporation that oversees the stewardship program. He says his desire to help First Nations people was inspired by the foster family that helped him by taking him in when he was young. Photo by Madeline Lines. The seed of the stewardship program was planted in 2014, when Lepine launched the Tiny Home building program. It aimed to address the housing crisis in Carcross while giving struggling community members meaningful work and carpentry skills. In Carcross, a community with roughly 300 people, 45 people applied to the program. “So what that told me was that people were asking for help now,” says Lepine. The program combined in-class and on-site instruction, and was designed to have as few barriers as possible for those who wanted to participate. It also encouraged individuals to think about the future in a way many hadn’t before. More work programs followed the tiny houses initiative, including the construction of the Learning Centre -- a massive project Lepine says was 80 per cent built by local First Nation members. The Learning Centre showcases the culture, art, and history of the community and the Carcross/Tagish First Nation people. “What we wanted to do was entrench the tools that were given to the tiny house crew and the only way to entrench them was giving them more work and more support,” says Lepine. Soon, the federal government lent its support to start cleaning up the former Chooutla residential school site, and the stewardship program came to be. This is when Johnny Johns got involved. A residential school survivor, Johns was once known as someone who often came to the First Nation’s office with angry complaints about everything from employment to the financial management of the First Nation. Johns is now a mentor to the younger stewards. “I’ve been here since the beginning, and I haven’t taken any time off,” says Johns. Beyond training and development, the program is teaching important life skills. Now, the stewardship program has a team of 16 individuals from the community going wherever they are needed to clean up the land. This includes everything from landscaping, to wildfire management, to testing contaminated soil at the former site of the residential school. Johnny Johns, 64, oversees the work being done on the riverbanks he used to walk as a young man. He can’t remember a time when the water cut into the banks as deeply as it does now. Photo by Madeline Lines. Today, Johns is providing guidance to a team working to refurbish a riverbank that has slumped into the Tagish River, threatening to unearth an important archeological site. While six trucks haul gravel and dirt to build a protective berm on the riverbank, Johns explains how proud he is to be a mentor to some of the younger stewards. “It’s awesome to see them working. Carcross was [once] a place of no work,” Johns says. Working as a steward for just over a year, Johnny Johns recently celebrated his 64th birthday. Photo by Lisa Johnson. Back at the Chooutla reclamation site, David Wally is collecting soil samples and learning about the testing process with the help of engineer Darren Thomas, who is here to work and to teach professional skills. David says it is tedious work, but that it’s the first step to cleaning up the site, and eventually reclaiming the land for something else. “Each layer of dirt you test you have to clean your shovel and then your knife, take off your gloves and do it all over again,” he says. Down the road, David’s older brother, Shane Wally, 28, is clearing branches from the shore of Nares Lake with the youngest steward, Michael Wally, 15. They’ll turn the branches to mulch for landscaping outside of the Learning Centre. Shane Wally is David’s brother, and was featured in the documentary SHIFT for his work maintaining the Montana Mountain’s bike trails. Photo by Madeline Lines. 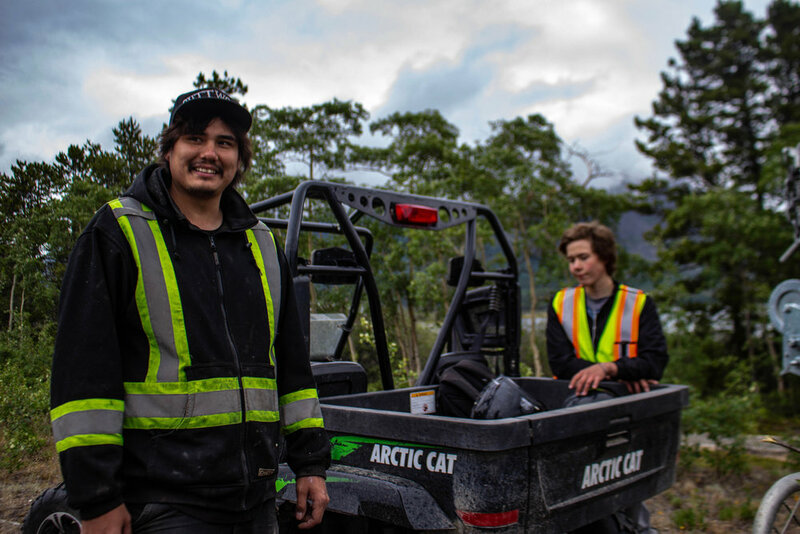 Shane started working with the stewardship crew after more than 10 years maintaining Montana Mountain’s bike trails for the Carcross/Tagish First Nation. “I seen what they were doing, painting the fences, landscaping as well, so I wanted to get involved with stuff like that,” he says. Shane wants to capitalize on his landscaping experience and start his own trail-building business in Alberta. Lepine has watched some stewards develop into supervisors, and when the Chooutla site is cleaned up, he wants to see them start their own businesses or become project leads on future work, including the reclamation of former gold mines in the area. “Doing this landscaping at the Learning Centre, that’s a training ground for these individuals,” says Lepine. Jared Gatensby, 17, is spreading gravel in front of the Learning Centre. He grew up in Carcross, and spends his time working as a steward when he’s not cleaning and clearing mountain-biking trails on the mountain. Jared Gatensby says he is proud to do work that makes the surroundings look pretty, as he works to landscape in front of the Learning Centre. Photo by Madeline Lines. He would rather be working outside and creating things he can be proud of than working any of his previous service industry jobs. It’s more than manual labour, though. “They need to understand the indigenous soils, the indigenous plants, and so we worked with elders to design what that landscape would look like at the Learning Centre,” says Lepine. Lepine says he began to see the successes of the program and the effect on individuals’ lives almost immediately after it began. The stewardship program is a national pilot project that could be adopted by other First Nations communities across Canada, and Lepine would like to see territorial, provincial and federal governments administer and promote similar programs. Many of the stewards’ projects are a direct response to the lingering history of colonization. While healing the damage done to the land by the government or industry, stewards are also reclaiming their right to a meaningful education -- something survivors of residential schools were never given. This is part of the reason why participants are called stewards, rather than apprentices or trainees. While plans for the former Chooutla residential school site remain up in the air and are being debated within the community, many of the stewards hope the site can become something new. Even though it is important to learn from and acknowledge history, Shane Wally believes the site can be transformed. Today, much of the garbage at the Chooutla reclamation site is gone. Kashies James excavates soil at the former Chooutla residential school site so it can be tested for toxic material. Photo by Madeline Lines. Still, some of the damage, including hydrocarbons -- elements of gas and petroleum products that were dumped into the ground -- remain as invisible health hazards. David Wally labels the soil carefully to be sent to the lab for testing. Photo by Madeline Lines. By the end of the morning, David Wally is labelling plastic jars and loading them into coolers in the back of a pickup truck with Thomas. “We get it all bottled up, label everything,” he says. It’s only digging holes and testing dirt, he says. But it is an important step in a long journey of reclamation, learning, and hopefully, healing.